The sun's activity influences environmental conditions in space adversely affecting satellites and space-based technologies such as telecommunications and navigational networks. The sun is also the primary natural source of energy for the Earth's climate. The sun's activity level changes but predicting these changes has been challenging. 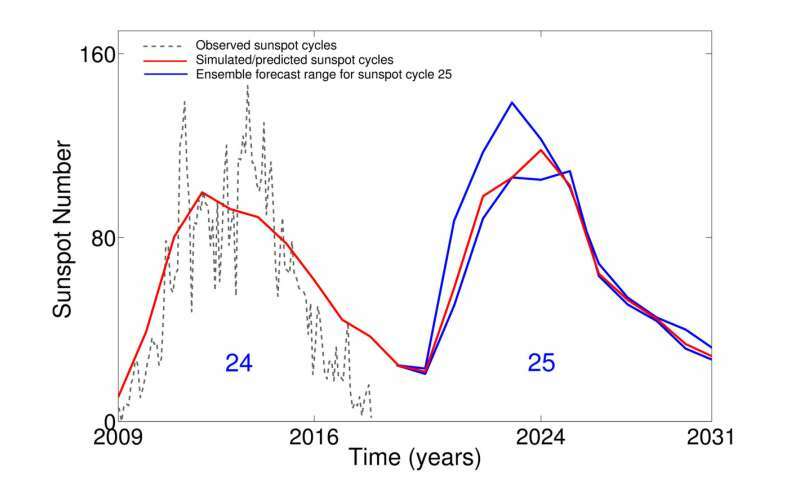 Now a team of two scientists from the Center of Excellence in Space Sciences India at IISER Kolkata has come out with a prediction for the upcoming sunspot cycle which reveals the expected conditions in space over the next decade. Their research work appears today in the journal Nature Communications. Just like weather on Earth, there is weather in space. The sun radiates light in various colours, including some that we cannot perceive such as UV rays and X-rays. A constant stream of charged particles consisting of electrons and protons also flows out from the sun permeating the solar system. 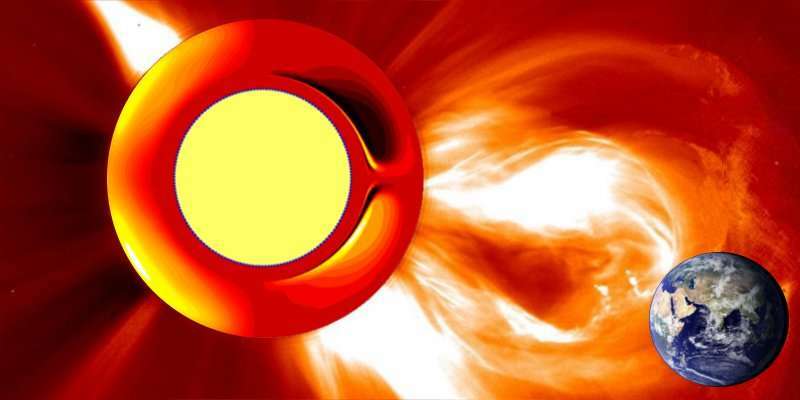 Sometimes the sun releases vast magnetic storms that speed towards Earth at astonishing speeds. These space storms can cripple satellites, trip electric power grids and lead to large-scale telecommunication breakdowns. It has been known for some time that the cycle of sunspots control all these aspects of solar activity and determines its influence on our space environment and climate. Astrophysicists have been attempting for decades to devise intelligent methods of predicting the future occurrence of sunspots. Sunspots are about ten times the size of Earth and have magnetic fields which are ten thousand times stronger. These spots have been observed through telescopes since the times of Galileo and these observations show that there is a cycle of sunspots with some cycles being stronger or weaker than average. 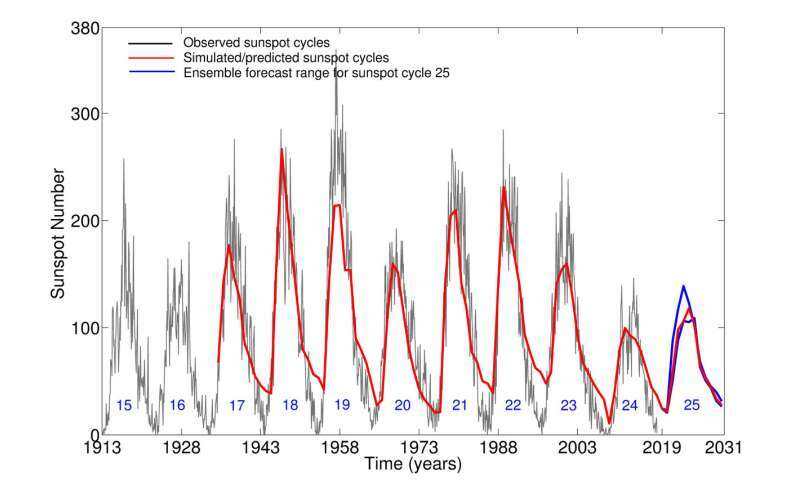 The current sunspot cycle dubbed as solar cycle 24 is just ending and it has been one of the weakest cycles in a century. In fact, over the last several decades, successive sunspot cycles have significantly weakened in strength and some earlier studies based on simplistic statistical approaches have claimed a significant weakening of the sun's activity is imminent, resulting in a loss of sunspot cycles. The last such episode, known as the Maunder minimum occurred between 1645-1715 and coincided with the little ice age, a period of long winters and global cooling. This association has led to widespread speculation that a significantly weak sunspot cycle 25 or an impending disappearance of sunspots for many decades would alleviate global warming and bring down the Earth's temperature. Complex flows of ions and electrons inside the sun produce these magnetic sunspots. Their creation is hidden from our view and the only way to understand how they form is through computer models relying on solving a set of complicated mathematical equations. Combining two different computer models of the sun based on such equations, one for studying conditions in its interior where sunspots are created and the other for its surface where sunspots are destroyed, Dibyendu Nandi, Professor at IISER Kolkata and an Associate at IUCAA and his Ph.D. student Prantika Bhowmik have devised a novel technique to predict the next sunspot cycle. Their technique has been very successful in matching sunspot activity observations over the last one hundred years – a first for any team in the world. Their method also makes it possible to make predictions almost a decade before the next sunspot cycle activity peaks in strength – again a first. Crucially, the Indian scientists predict that the next sunspot cycle would not be insignificant. Their ensemble forecast surprisingly suggests it could even be stronger than the cycle which is just ending. They expect the next cycle to start rising in about a year following the end of the current sunspot cycle minimum and peak in 2024. Bhowmik and Nandi predict space environmental conditions over the next decade would be similar or slightly harsher compared to the last decade. They find no evidence of an impending disappearance of sunspot cycles and thus conclude that speculations of an imminent sun-induced cooling of global climate is very unlikely.